In the arena of building, architecture and design, female contributors often get lost in the shuffle of a heavily male-dominated industry. 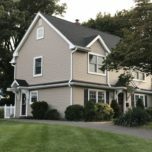 Over the years doing New Jersey home remodeling, we always look to our role models in design for inspiration and ideas. There are many female architects and designers that have contributed so much to the field and created iconic design masterpieces that inspire us today. In celebration of Women’s History Month, here are a few of architecture’s leading female icons. Louise Blanchard Bethune – The first recognized woman to work as a professional architect in the United States, Bethune started her own architecture firm in 1881. She was responsible for buildings ranging from stately hotels to school buildings, and pioneered one of the first US projects to use steel framing and slabs of poured concrete in construction. Norma Merrick Sklarek – One of the first African-American female architects to obtain an architect’s license in the United States, Sklarek operated primarily in New York, though her nation-spanning career would later take her to California. In the 1980’s, she kept her record-breaking momentum going by forming the first architectural firm to be created and run by an African-American woman. Julia Morgan – Aside from her extremely memorable work on California’s Hearst Castle, Morgan also holds the distinction of being the first female to be granted an architectural degree from the l’Ecole nationale superieure des Beaux-Arts in Paris, in 1902. She was also responsible for the majestic Los Angeles Examiner building, as well as a variety of other projects for the Hearst publishing empire. Has the thought of these trailblazing architectural feats inspired your own ideas at home? Call Trade Mark Design & Build today and let us help you build your own visually stunning legacy at home. This of course is by no means an exhaustive list. Tell us in the comments, who is your design inspiration? The first round of March Madness kicks off March 16, with tournament games extending into April. Upgrading your home entertainment room with premium features can make it the perfect place to watch the games in style. When it comes to house additions, Trade Mark Design & Build recommends these 5 upgrades for home entertainment rooms. 1. Use surround-sound to bring the game ambience to your home – Surround sound speakers and a surround sound receiver are key in a home entertainment room. Upgrade to a surround sound receiver that uses HDMI cables to simplify entertainment room cord sprawl. 2. Free up floor space with built-in media cabinets – Store all DVDs, video games and media in custom built-in cabinets to keep the floor free, so you can get a workout in while you watch. 3. Wall mount your flat screen TV for optimal viewing- Mounting your flat screen on the wall frees up floor space and ensures an optimal viewing angle from the comfort of your sofa. 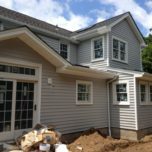 Leave mounting to the professionals in home renovation nj so that valuable investment doesn’t come crashing down because it wasn’t placed on a stud. 4. Install sound absorption panels to keep peace in the home – Basketball fans get loud in the heat of a tight game. Keep the family peace with sound absorption panels that muffle game energy throughout the house. 5. 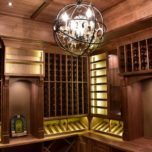 Install a home bar – A home bar equipped with a wine room or a draft keg line can really make you feel as if you’re watching the game at your favorite sports bar. If you are looking into NJ home remodeling, upgrading your entertainment zone might be just the thing to give your home the boost it needs! Black & white mosaic tiles makes for a beautiful floor design. 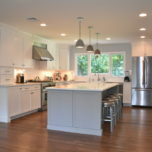 Floors steal the show in NJ kitchen remodeling trends for 2014. 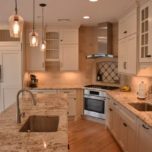 Kitchen makeovers are one way to increase the value of a home as we discussed earlier, but the focus needs to be on functionality. Flooring gives you an opportunity to add extreme style to the mix and get something really distinctive for your home, while ensuring sturdiness to last for years ahead. 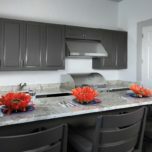 Overall, kitchen remodeling in Bergen County, NJ is focusing on color to create dramatic flair. You can top off a balanced kitchen with a fancy floor with a pop of color to give everything just a little more punch. 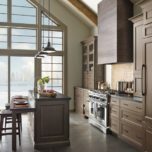 Patterned floors are in this year, and an experienced firm like Trade Mark Design & Build has access to some eye-catching products that enhance the kitchen color palette. 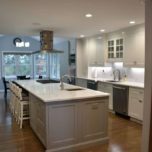 A kitchen with white walls and cabinetry for example, will really stand out with a white and black beveled cube design on the floor. Look for a pattern that creates depth using colors and lines to make the geometric designs stand out. The nice thing about vinyl flooring is the ability to create illusions with it. 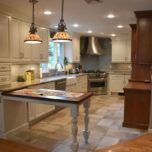 Vinyl is a common choice for kitchen floors because of its low cost and resilience. You don’t have to settle for boring just because you opt to save. Choose a pattern that imitates tumbled marble or hardwood. You get a nostalgic look that adds to the kitchen’s appeal without the expense of real wood flooring. The focus of the International Ceramic Tile Fair in Spain this year was creating oxidized looks that give the appearance of stone, metal and wood for contemporary flooring, proving illusion as a design concept works. Flooring designs are the style anchor for any room. Make your kitchen stand out with bold choices for 2014. Contact the Trade Mark Design team to see what flooring options we create for your home.